Spain’s ‘Constitution Day’ on 6 December celebrates the anniversary of the country’s transition to democracy after four decades of rule under dictator Franco. On Thursday, politicians and state officials addressed the Spanish Congress, calling for national unity and urging respect for the country’s institutions. It comes at a time when Spain is facing challenges from the Catalan independence movement with four of the Catalan leaders in pre-trial prison on a hunger strike, increasing criticism of the justice system – as well as the rise of the far-right party, Vox, in the recent Andalusian elections. 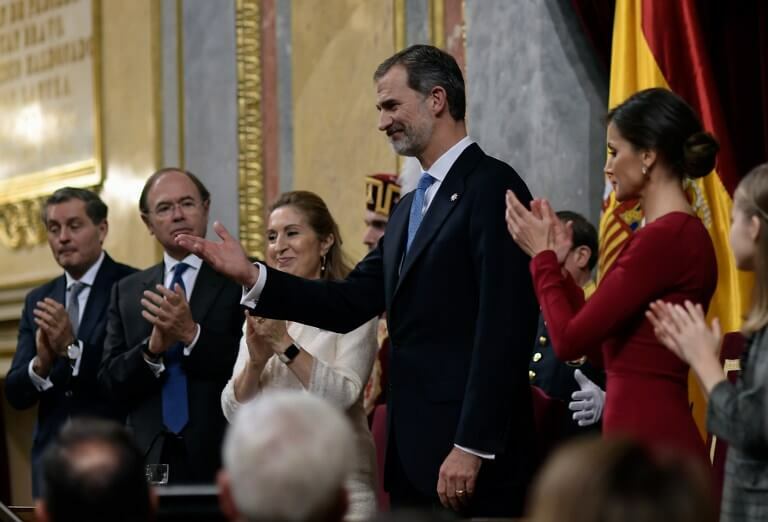 Felipe VI also stated in his address that the 1978 Constitution had contributed to the development of Spain because ‘it does not divide but unites Spaniards, as a result of agreement and consensus’. Felipe VI made his speech in the presence of his parents, Juan Carlos I and Sofía. The Spanish Prime Minister Pedro Sánchez was joined by four previous prime ministers: Felipe González, José María Aznar, José Luis Rodríguez Zapatero and Mariano Rajoy. In the speech delivered by the Speaker of the Congress, Ana Pastor, she said ‘there is no room for anything outside the Constitution’. The 40th anniversary coincides with political debate and division, however, over the need to reform the Spanish Constitution. While Pedro Sánchez himself is in favour of reforming the constitution, advocating for major changes such as suspending the king’s inviolability and modifying the territorial structure, he rejects allowing a vote on Catalan independence. The leaders of the governments in Catalonia, the Basque Country, Navarre and the Balearic Islands did not attend the ceremony in Madrid today. In Girona, in northern Catalonia, police clashed with a group of anti-fascist demonstrators protesting against an event to mark the constitution’s jubilee in the city, supported by parties including the far-right Vox and the People’s Party (PP). One person was arrested and four police officers injured.